CQRlog is sure among the very first loggers resolving Z6 properly and, in accordance with ClubLog/G7VJR introduces Rep. of Kosovo as a regular DXCC Country since 2018-01-21 00:00:00 (subject to change when ARRL release the technical data). Pursuant to Article 19 of the Radio Regulations, notably its provisions Nos. 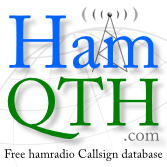 19.28B and 19.33, the management of international series of call signs is a prerogative of ITU. Call sign series can be allocated only to the administrations of the ITU Member States by world radiocommunication conferences or, between radiocommunication conferences, by the ITU Secretary-General. In this respect, the attention of the ITU administrations is drawn to the fact that ITU has not allocated call sign series Z6 to any of its Member States. Consequently, the utilization of call signs series Z6 by any entity without a formal allocation and consent of the ITU represents an unauthorized and illegal usage of this international numbering resource. We know of it since the first moment. Like Club Log, the DXCC criteria apply here, therefore Z6 will remain until its DXCC status oficially changes. The ITU Operational bulletin can't change the country files, sorry. We will ignore it, our criteria are bound to DXCC.